Visitors and exhibitors alike enjoyed a high quality experience at Sensors & Instrumentation, the UK’s only national instrumentation exhibition sponsored by Mouser Electronics, which took place in Hall 1 at the NEC Birmingham from Tuesday 25 to Wednesday 26 September. The 2018 edition saw the show’s successful co-location with What’s New In Electronics (WNIE) Live, which gave visitors unlimited access to hundreds of companies showcasing thousands of innovative products and solutions. In addition to this, visitors enjoyed the most action-packed and informative Sensors & Instrumentation programme to date. With a two day CPD accredited seminar programme – featuring companies such as Microsoft & PCT, Siemens GB&I, Ocean Optics and Myriad Group – and the brand new ‘hands-on’ Engineering Workshop, visitors were able to take home a wealth of invaluable knowledge. The FLC Zone, a dedicated area for the flow, level and control sector, also launched at the show alongside returning favourites, the Formula 1 Simulation Car sponsored by Rheintacho and the Innovation Showcase, sponsored by Bronkhorst UK. With so much on offer, the show attracted a highly targeted and engaged audience, as noted by exhibitors. 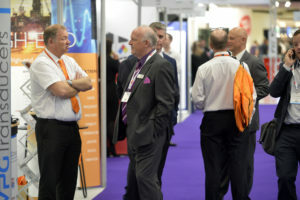 Rob Weemes, business development manager and Jeff Gurr, e-mech specialist, at Charcroft Electronics noted that there had been a “steady flow of high-quality visitors” resulting in “a good number of leads”, with many engineers visiting their stand to source products for specific applications. Sensors & Instrumentation will return next year and will celebrate its 10th anniversary with the introduction of a fresh look and brand new dates.